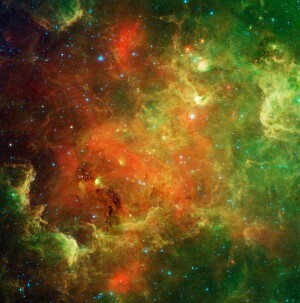 Mercury, the solar system’s innermost planet, reaches its greatest western elongation from the sun on Saturday, May 7. Because Mercury is farthest west of the sun at present, this world now rises into the morning sky before sunrise – but how much before depends on where you live on the globe. The farther north you live, the closer Mercury rises to sunrise. The farther south you live, the greater the period of time between the rising of Mercury and the sun. 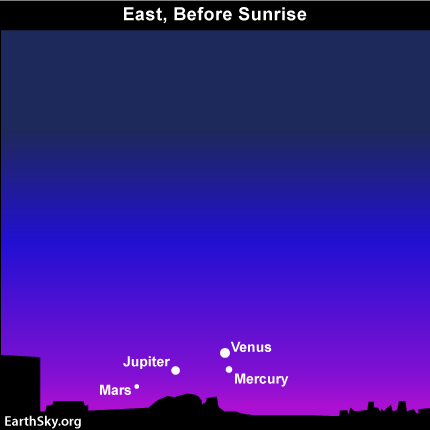 For instance, at mid-northern latitudes, Mercury comes up about 45 minutes before sunrise. Yet, at temperate latitudes in the southern hemisphere – as in southern Australia – Mercury rises two hours or more before the sun. Do not mistake the dazzling planet Venus for Mercury. Mercury, though as bright as a first-magnitude star, pales next to Venus, which outshines Mercury by nearly 60 times. If you see Venus but not Mercury, aim binoculars at Venus to spot Mercury nearby. 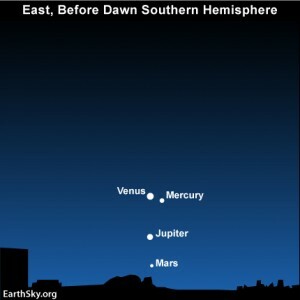 Three planets will fit within the same binocular field before sunrise for well over a week: Venus, Mercury, and Jupiter. Venus is the brightest of the pack, followed by Jupiter and then Mercury. Mars, the faintest of the four morning planets, will share the same binocular field with Jupiter for the next few days. From the northern hemisphere, however, Mars will be exceedingly hard to see, with or without binoculars. Before sunrise, use brilliant Venus to find fainter Mercury, which reaches its greatest morning elongation on Saturday, May 7. Site contents copyright © 2019 Recorder Online	except as noted. All rights reserved. | 88 queries in 2.191 seconds.